Sweet cherry 'Stella' is the one to grow, even if you only have space to grow one fruit tree. 'Stella' Cherry is 'self-fertile' (which means it does not need a second variety of cherry tree to pollinate it) and is a really heavy, reliable cropper because it has good resistance to late frosts. Unlike most other sweet cherry varieties, 'Stella' will thrive in slightly exposed locations but can also be grown in a pot on your patio. 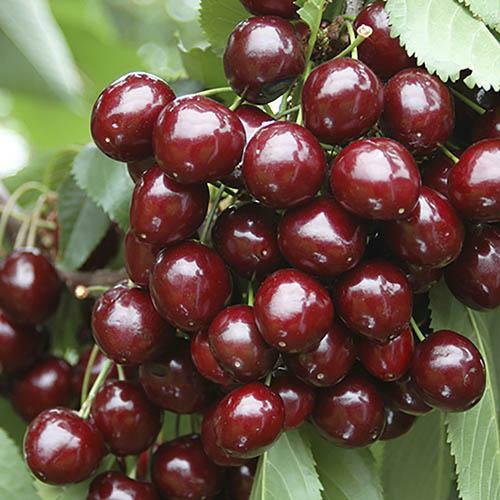 The sweetly flavoured, dark-skinned, plump and juicy, aromatic fruits will be ready to pick from mid to late July each year and from the third growing season onwards, you can expect upwards of 5kg (11lbs) of cherries per tree, which will save a small fortune compared to paying supermarket prices. Additionally, the beautiful cherry blossom which appears from early March, will brighten your garden and mark the beginning of spring. Our grower quality multi-branched bare-root trees have been grafted on to 'Colt' rootstock to provide a compact and manageable habit. Supplied as a 1.2 - 1.4m tall, grower quality, multi-branched, grown on a dwarfing 'Colt' root stock. Cover the cherry tree with nylon mesh or netting to prevent birds from stealing your crops - ‘Stella’ cherry trees are also known as the bird cherry as they will steal most of your cherry crop if you do not stop them. Add Rootgrow Mycorrhizal Fungi to give your plants a head start and establish faster. Best grown in moderately fertile soil in full sun. If grown in pots keep well watered. Mature trees will just need a simple prune to remove dead or crossing branches or to open up the center or maintain shape - unlike other fruit trees, “Stella” cherry trees do not need pruning to keep them fruiting. Train fan-trained trees in spring. Prune established fans and carry out routine pruning on established cherry trees when harvesting the fruits in summer.